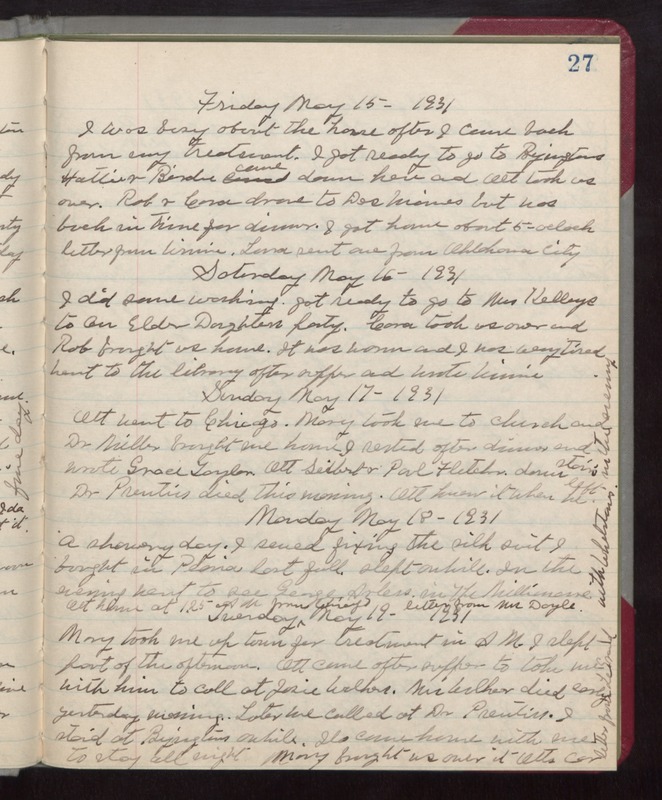 Friday May 15- 1931 I was busy about the house after I came back from my treatment. I got ready to go to Byingtons Hattie & Birdie came down here and Ott took us over. Rob & Cora drove to Des Moines but was back in time for dinner. I got home about 5-oclock letter from Winnie. Laura sent one from Oklahoma City Saturday May 16- 1931 I did some washing. got ready to go to Mrs Kelleys to an Elder Daughters party. Cora took us over and Rob brought us home. It was warm and I was very tired Went to the library after supper and wrote Winnie Sunday May 17- 1931 Ott went to Chicago. Mary took me to church and Dr Miller brought me home I rested after dinner and wrote Grace Taylor. Ott Seibert & Paul Fletcher down stairs Dr Prentiss died this morning. Ott knew it when he left. Monday May 18- 1931 A showery day. I sewed fixing the silk suit I bought in Peoria last fall. slept awhile. In the evening went to see George Arless. in The Millionaire. with Whetstones in the evening Ott home at 1.25 AM from Chicago letter from Mrs Doyle. Thursday, May 19- 1931 Mary took me up town for treatment in AM. I slept part of the afternoon. Ott came after supper to take me with him to call at Josie Walkers. Mrs Walker died early yesterday morning. Later we called at Dr Prentiss. I staid at Byingtons awhile. [Ilo?] came home with me to stay all night Mary brought us over it Otts car. letter from LeGrand.